so for those followers who like charts, soccer/football, filling things out or all of the above, i give you “keeping track of the euro 2012,” a handy-dandy, fill-in-your-picks euro 2012 chart. use it in advance to fill in your picks and see how well you do, or just make note of the scores to keep track of all the games. it prints snugly on letter-sized paper. print it here. it’s fantasy football time, folks. 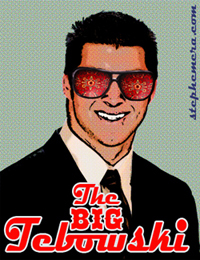 at the beginning of its sophomore year, the big tebowski is looking good. this is my mascot.